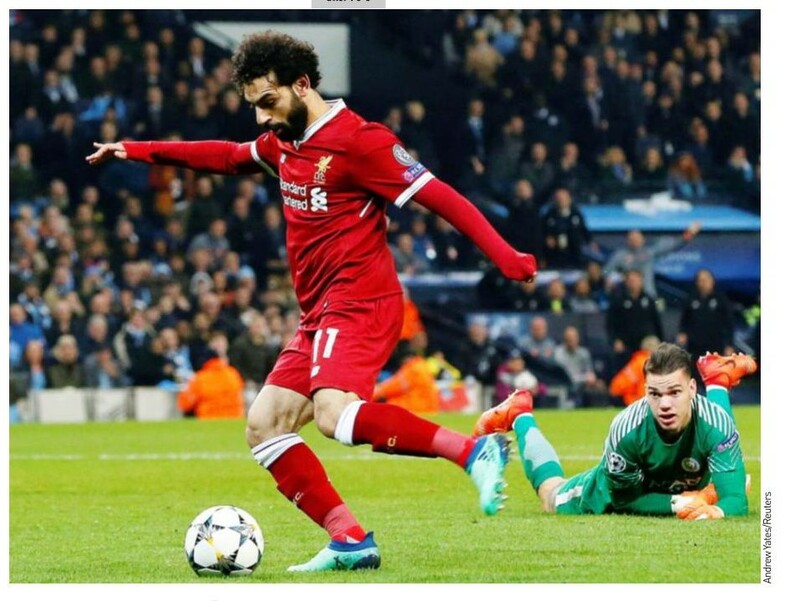 At the beginning of the week, Manchester City (despite being virtual champions) were on the ropes after two consecutive defeats (Liverpool in CL and Manchester United in the League). The odds were against Manchester City to overcome their (0-3) deficit against Liverpool in the CL Quarterfinal second leg at home on April 10th. Manchester City scored early through Gabriel Jesus and continued pressing. Just before halftime, Leroy Sane scored a second goal but it was unjustly ruled offside. Manchester City Manager Josip Guardiola would be sent off for protesting this decision. Liverpool would come back and score twice to eliminate Manchester City and defeat City for the third time in the season. Two days later, Arsenal reached the semifinals of the Europa League after a (2-2) tie vs. CSKA Moscow. On Saturday, it was back to the business of the League and Manchester City bounced back after three straight defeats to defeat Tottenham (3-1) at Wembley. Manchester City would be assured of the title if Manchester United slipped up on Sunday against WBA. However, most expected a comfortable Man Utd victory against a weak opposition at home. Against all odds, WBA won (1-0) through a Jay Rodriguez strike. This handed the title to Manchester City with matches to spare. It was their third title in seven seasons. Guardiola has won League championships in Spain, Germany and now England. Arsenal’s loss on Sunday vs. Newcastle United (1-2) was their fifth straight away loss of the calendar year. The worst run in EPL history for the club and their worst run since December 1984. It is also the first time since 1925 (93 years) that Arsenal have lost their first five away matches in a year. Guardiola was charged with improper conduct (for communicating with the bench in the second half after being sent off) by UEFA, who also charged Liverpool for setting off fireworks and throwing objects from their fans. -The draws for the semifinals of the European competitions were made. In the Champions League, Liverpool are to face AS Roma. -Manchester City are the 2017/18 English Premier League Champions following Manchester Unkited’s loss (0-1) to WBA. 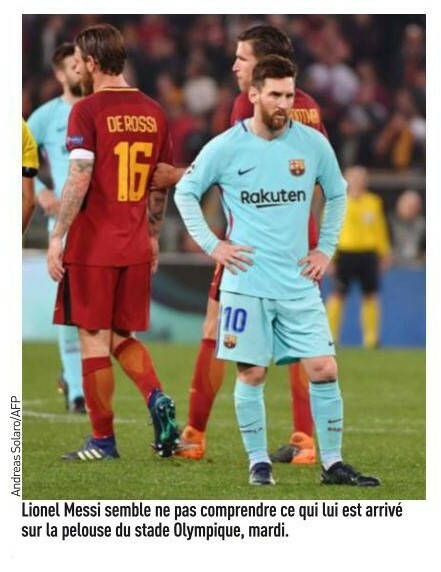 When the week started the prospect of Roma and Juventus overturning deficits in the Champions League against powerful Spanish opposition seemed unlikely. 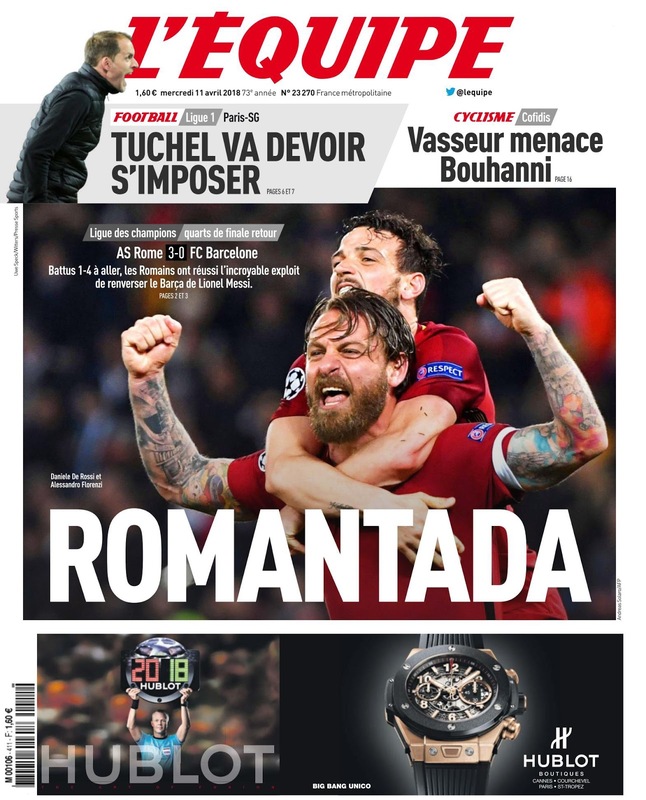 By the end of the week, Roma had staged one of the most talked about comebacks in European Cup history by defeating a lifeless Barcelona (3-0) in Rome. The comeback was dubbed as ‘Romantada’. The city of Rome was in absolute euphoria and Roma President James Pallotta celebrated by diving in the fountain ‘Fontana dei Leoni’ in Piazza del Popolo (and was fined). An even greater comeback nearly came off the following day as Juventus took a (3-0) lead in Bernabeu against Real Madrid to tie the deficit. Then the unthinkable happened, the match appeared headed for overtime, when the English referee Michael Oliver awarded a penalty kick for Real in the injury time after Juventus’ Mehdi Benatia was adjudged to have fouled Lucas Vazquez. 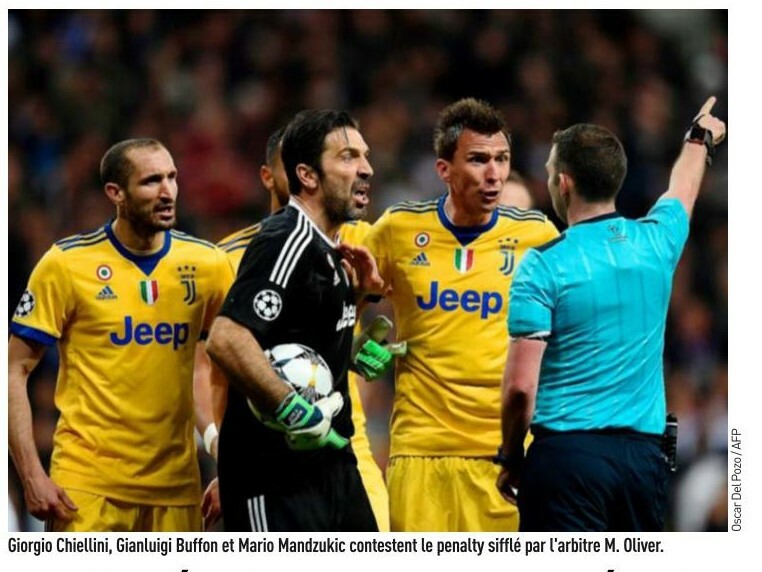 Predictably, Juventus players furiously protested the decision and Gianluigi Buffon, Juventus’ captain and goalkeeper, was sent off amidst the protests. Cristiano Ronaldo would score from the free kick to eliminate Juventus, but given the sense of injustice Juventus had won the hearts of most neutral fans. On the following days, the debate continued (on social media as well) whether a penalty kick was justified or not. Back to the business of the League on the weekend. Napoli dropped two crucial points on a road trip to San Siro in a scoreless tie with AC Milan. A new galvanized Juventus, defeated Sampdoria (3-0) to open up a six point lead over Napoli and take a crucial leap towards a seventh successive title. At the beginning the week, unbeaten Barcelona and Real Madrid appeared to have comfortable leads in the CL over their Italian opponents and the second leg ties seemed a formality. As stated in the Italian section above both sides would be given a scare. Barcelona’s exit appeared to mark an end of an era at least in the CL. Their poor performance was decried all over the Football world. Likewise, Real Madrid, despite advancing, were subject to criticism from many circles for the manner of their qualification as well as the perceived favoritism from UEFA. Real Madrid Manager Zinedine Zidane would defend his team against the criticisms, but it is clear that the neutrals are no longer in their corner after the events concerning the penalty kick and the sending off of Buffon. The League title appears to be Barcelona’s and they confirmed with a win over the weekend over Valencia (2-1) despite not impressing much. Atletico Madrid maintained their distance in the second place with a win over Levante (3-0). Real Madrid has its sights set on the CL as the only trophy it can win this season. Zidane fielded an under-strength team vs. Malaga (resting CR 7, Marcelo, Kroos, Bale, Modric (injured)). Real Madrid won (2-1) at Malaga to maintain their third place. This was Zidane’s 100th win as Real Madrid Manager. -Former Real Madrid Manager, the Argentine Jorge Valdano criticized Welshman Gareth Bale’s display in the match vs. Atletico Madrid (1-1) over the previous weekend. -Alaves and former Barcelona striker Munir El Haddadi aims to change his nationality to play for Morocco in the World Cup in Russia. - Atlético Madrid made an initial offer (that was rejected) for Vasco Da Gama’s 17-year old forward Paulinho (Brazil U-17 International). In the Champions League, Real Madrid are to face Bayern Munich. -UEFA has decided against a punishment against Real Madrid’s Sergio Ramos. In the closing stages of the match vs. Juventus, the suspended Ramos had come down from the stands near the players’ tunnel. 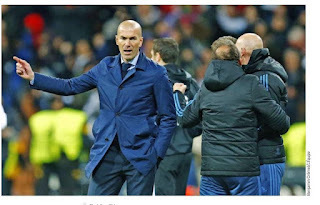 -Real Madrid Manager Zinedine Zidane expressed outrage and disappointment at suggestions that Real Madrid’s win over Juventus had been a ‘robbery’. Bayern Munich had won the League title in the previous weekend. This was their unprecedented sixth straight title. In the CL, they held an away win (2-1) advantage over Sevilla. At home, they did not exert themselves and did the minimum for a scoreless tie to advance to the semifinals. The most important event of the week concerned the appointment of Nico Kovac (current Eintracht Frankfurt Manager) to succeed the retiring Jupp Heynckes as the next Bayern Manager. Bayern will still have Ribery and Robben for one more season as both veterans signed on for one more year. -According to Kicker, Bayern Munich’s French star Franck Ribéry will extend his contract (due to end this season) by one year. Similarly Arjen Robben has also extended his contract by one year. The outcome was never in doubt, as Paris St. Germain are just head and shoulders above anything else in France. However, the (7-1) result over its closest challengers and defending Champions AS Monaco was unexpected. 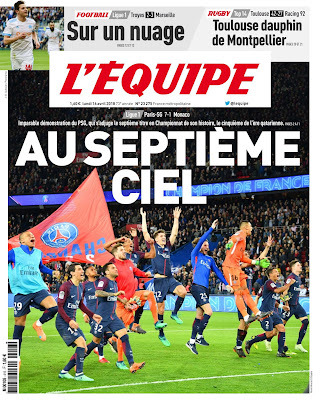 The win ensured PSG were mathematical champions. Monaco’s title win the previous season had been an anomaly and not many tipped them to repeat once they had sold majority of the players that had won the title (including Kylian Mbappe to PSG). Of course, PSG have grander ambitions than domestic supremacy and the main news off the field was the appointment of the German Thomas Tuchel to replace Unai Emery on the bench for next season. 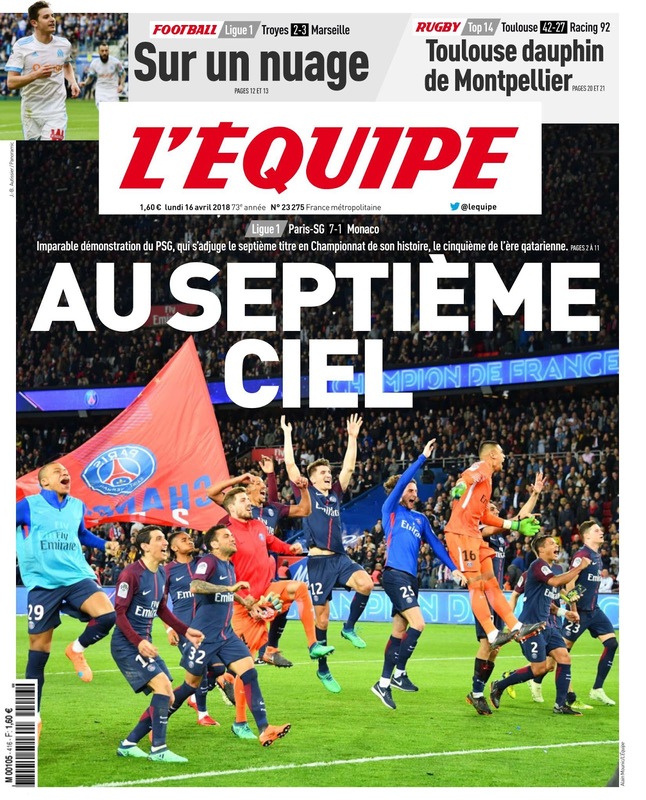 Olympique Marseille had a good week, qualifying for the Europa League semifinals after defeating RB Leipzig (5-2) and then defeating Troyes (3-2) to get closer to CL qualification. -Paris St. Germain are the 2017/18 Ligue 1 Champions after defeating AS Monaco (7-1). This is their fifth title in the last six seasons.